- Zero One Fire Festival '01 (September) = Horshu competed in the league, which was won by Shinjiro Ohtani. - OVW March Mayhem (March 6, '04) = Inspector Impact & John Laurinitis fell to Matt Morgan & Sean O'Haire. 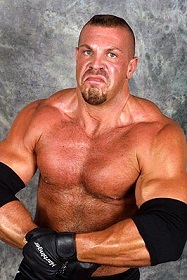 - OVW Super Summer Sizzler Series (May 21, '04) = Inspector Impact was beaten by "Mr. Wrestling II" (Nick Dinsmore). - WWE Great American Bash '04 (June 27) = Luther Reigns defeated Charlie Haas. - WWE No Mercy '04 (October 3) = Reigns fell to Eddie Guerrero. - WWE Survivor Series '04 (November 14, '04) = Reigns, Kurt Angle, Mark Jindrak, & Carlito Caribbean Cool fought in an "Elimination" Match with Eddie Guerrero, John Cena, Rob Van Dam, & the Big Show. Reigns was eliminated by the Big Show, who 'survived' along with Guerrero & Cena. - WWE Armageddon '04 (December 12, '04) = Reigns, Kurt Angle, & Mark Jindrak lost a "Handicap" Match to the Big Show. - WWE Royal Rumble '05 (January 30) = Reigns competed in the Royal Rumble, which was won by Batista. - WWE No Way Out '05 (February 20) = Reigns was beaten by the Undertaker. - WWE Wrestlemania 21 (April 3, '05) = In a dark match, Reigns competed in a "Smackdown vs. Raw Battle Royal", which was won by Booker T.